THE LIGHT – a special release of only 28,000 bottles – to celebrate spring and summer in Orkney. Presented in a beautifully embossed green glass bottle, the serpent dragon design takes its inspiration from the great Norse sagas. Let’s enjoy a wee taste. 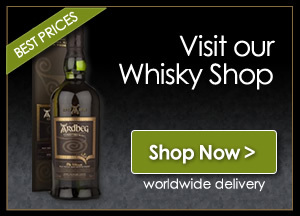 Nose… Mild burning heather brings the nose alive, some fragrant herbal peat, wood shavings and vanilla. Taste… In the distance is a sleepy fishing village, some soot, cough syrup, a touch of pepper/chilli spice, vanilla, green pitted olives in brine,very satisfying with smoked sea salt, add a teardrop of water and in comes wet rocks and the bung cloth, this is a dram and a half. Finish… Smoke and peat seem to be in charge with vanilla and oak following on then there is a wee citrus twist at the end. 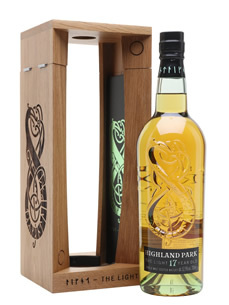 This is a dram not to be taken lightly (no pun intended) it is quite complex and has everything you would expect from an aged cask strength Highland Park. Priced at £190.00 for a 70 cl bottle may seem a touch expensive, but please take a chance to taste it, then it makes sense of the pricing and I would expect it to sell out fairly quickly. Well done all at Highland Park Distillery, yet another winner on your hands.